Bangkok has quite a number of Muslim restaurants spread around town. A few of them is really worth a visit. Busaba is one of them. 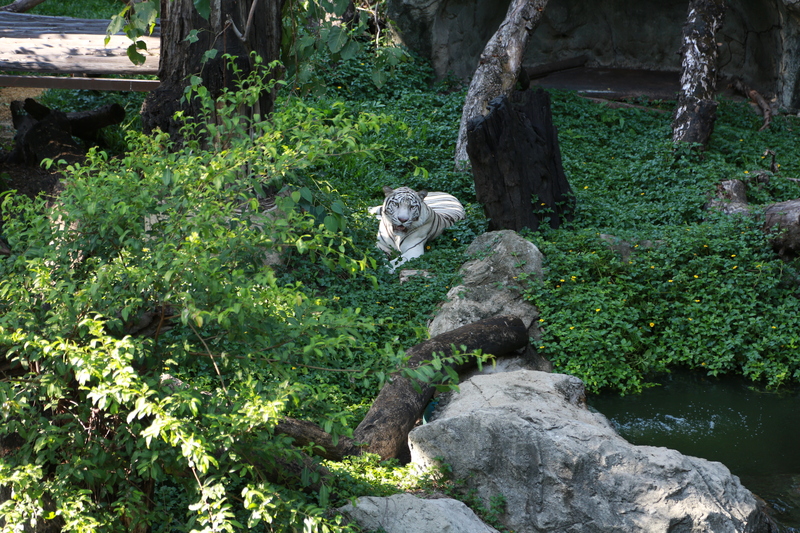 You find it in the Sri Yan market area and the Dusit Zoo is just a short walk away. a perfect spot if you have kids chrusing your legs. Busaba is packed during rush hours. I stayed a few days in the Sri Yan area, part of Dusit province and the administrative center for Thailand some weeks ago. It’s out of the BTS and MRT coverage, but the Sri Yan area is definitively worth the 20 minutes taxi trip. Busaba is packed during lunch hours, so you might need to give it a few minutes before you get a seat. But that said, the food is delicious, so I wouldn’t really hesitate about that. The kitchen is outside while you have the seating inside with air-condition. The place is clean and welcoming. Their focus is on roasted duck, but they have a variety of many well known Thai dishes with beef, chicken and seafood as well. You can find part of the menu on the wall, but they also have a handout that comprises many other dishes as well. The wall menu give and idea of their speciality, meaning roasted duck. 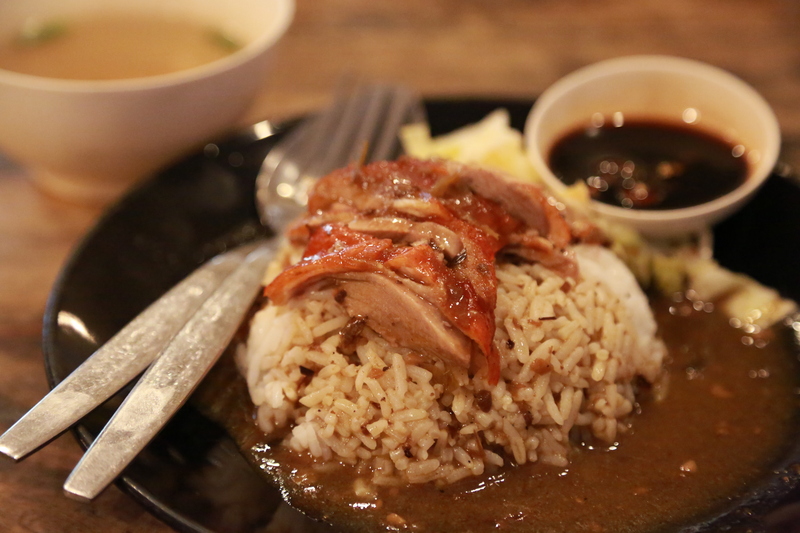 I ordered two dishes, roasted duck on rice that also came with a soup, and pad ka prao. Two dishes you’ll find everywhere in Bangkok, and also two dishes well suited to check out the kitchen skills. Let’s take any doubts away immediately. The roasted duck is really good, juicy and with tasty skin. Just as it should be. It comes with a flavorful sauce that is well balanced and not to sweet. A soy dipping sauce is served on the side for variation. And the rice is cooked to perfection. The pad ka prao was also very good, a bit different from most street side vendors, as it lacked the ordinary spiciness, but the simplicity is kept with not to many different flavors competing for your taste buds. The beef also came in bite size peaces instead of the usual minced meat version you get most places. 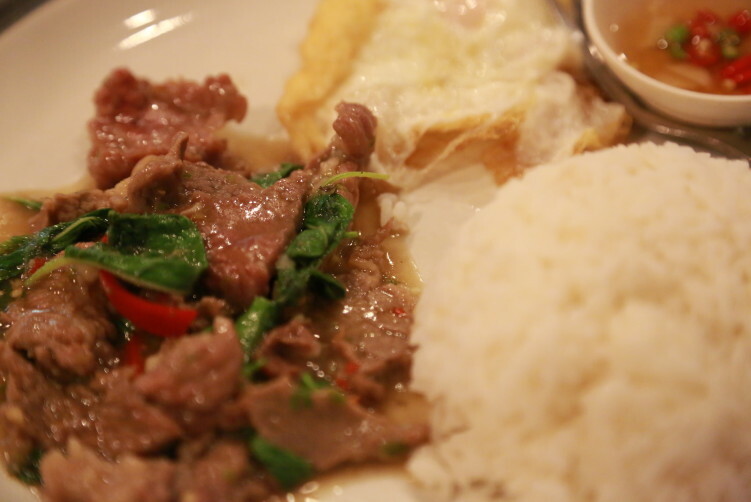 It’s really the first time I have eaten a pad ka prao with beef that’s slightly red inside. But that said, with quality meat and a hygienic environment I can really understand why they do it. It might not be the authentic Thai way, and also not the best pad ka prao I’ve had (as it lacked the spiciness when coming out from the kitchen), but it certainly was a very good version. I really enjoyed the way they treated the beef. I also admit that it might suite quite some tourists in a better way than the spicy and original version I normally prefer. You find chilies on the side for those who wants to spice it up a notch or two, which I did. It might be the perfect spot really to eat your first pad ka prao. Roasted duck is their specialty, but judged from the pad ka prao, I’m pretty sure that most dishes at Busaba is an attractive mouthful. The atmosphere at Busaba is also good, relaxing and with good service. As mentioned, the place is clean and hygienic. The Sri Yan area has a fair amount of good eateries to choose from. 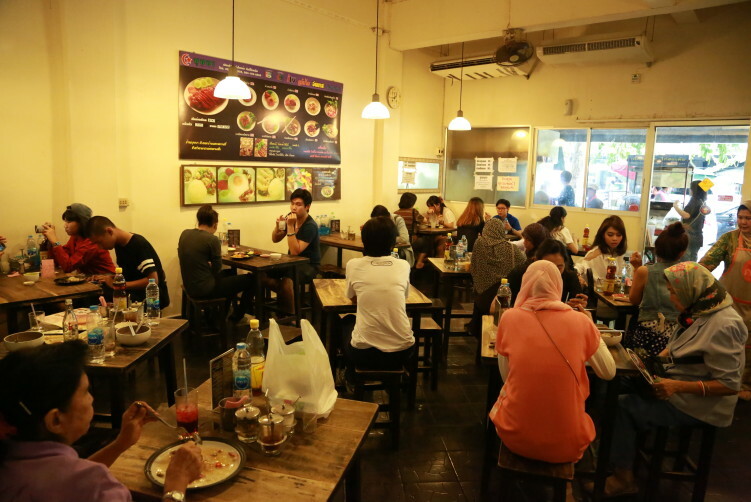 Three other options nearby is Look Chin Moo Nai Hang for pork noodles, Mae Tuk for pork knuckles and Orawan for one of the best Pad Thai there is in Bangkok. buy now Food: Wide variety of Thai dishes. No pork. viagra without prescription Price: Cheap to moderate. Duck with rice is 50 Bath and pad ka prao is 60 Bath. 20 Bath for Ice tea. https://sheisfiercehq.com/shop/ Open: Mon 9am – 5pm, Tue-Sun 9am – 8pm. Be aware that the duck sometimes doesn’t last all day. 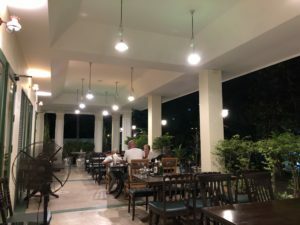 click here Address: Nakhon Chaisi 151/4 (sometimes written Nakhon Chai Si), Situated in the Sri Yan area and only a 3-4 minute walk from the Chao Phraya river in case you come by ferry. How to get there: BTS to Victory Monument and a 15 minutes and 50 Bath taxi drive from there. Or you come the waterway. 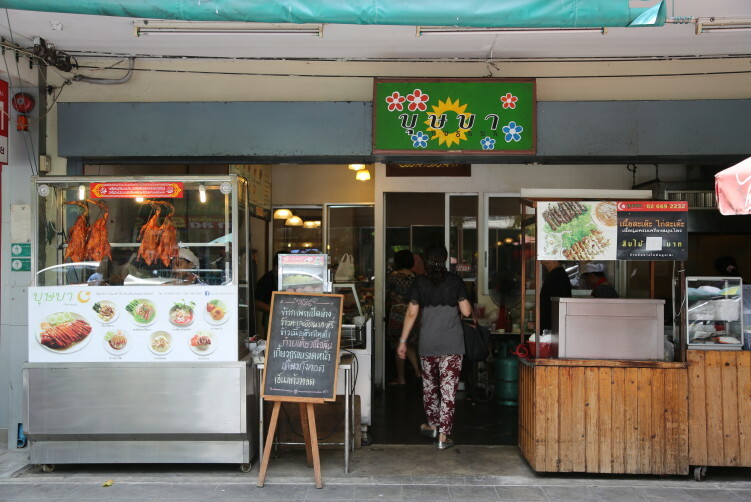 Payap pier takes you directly to Sri Yan market in Dusit district. The pier is a short 5 minutes walk away, just follow the Nakhon Chaisi road from the pier. The resto is on the other side of the road from the market entrance. If you’re on a budget get of at Victory Monument Station, walk the sky walk towards the monument and turn left to get to down to the bus stop. Get on the No. 14 bus Sri Yaan Market. The conductor will shout out the name of each stop. So, listen carefully. The journey takes about 20 mins. Cross the road and turn left. Walk towards CIMB Bank and you find BUSABA next the bank.